Having water for 8-10 glasses is adviceable everyday, you can also enjoy the impact of healthier skin by doing this. Generally water makes you skin glow and remove all toxic substances from blood and body and purify your cells and give all nourishment to it. Make sure you'resufficient with that multivitiman. B-vitamins, iron, and Vitamin E are essential for healthy skin. Your dark circles will disappear after just few days with a vitamin E boost. Chamomile tea bag. 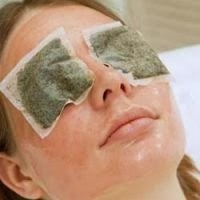 Soak some chamomile tea bags in hot water, then rinse in cold water to create an eye-pack. Just applyingn these on your eyes for about 20 minutes will drastically reduce puffiness and can help diminish dark circles quickly. Vitamin C plays a significant role in skin health, and if you're not getting enough of this vitamin in your diet, you're limiting your chances that refresh glow each morning. Improve your diet with a vitamin-C infused drink or supplement, or just add a few oranges or grapefruit to your daily fruit intake. Sliced cucumber on your eyes, and is still used at many high-end spas and all luxury facial treatments today. Just a couple of iceon your eyes will help reducing puffiness and tighten and tone the undereye area. Usage of Vitamin K-infused cream is recommended. Vitamin K helps fixing broken capillaries, and applying a thin layer once or twice per day can help you take care of this sensitive area . Look for organic products so that it will not harm your skin. Go for less salt-food. Intake of too much salt usually leads to fluid-retention, which in turn can grew up to puffiness under your eyes. Dark circles under the eyes are more prominent looking on aging skin since the area becomes so delicate and thin. Improving your skin tone with water, a healthy diet, and exercise can help reduce or diminish dark circles naturally and spotlessly.